Apple iPhone OS 4.0 vs. the Competition: How Does it Compare? Apple plans to fuse basic Facebook functionality into the core operating system of its next-generation iPhone expected this summer, according to hackers who have dismantled the OS. The new functionality is said to include the ability to integrate your Facebook contacts into the iPhone's address book; use Facebook profile pictures for your iPhone contacts; and sync Facebook Events with your calendar. Hackers recently discovered the rumored features on a jailbroken iPhone running iPhone OS 4.0, the new iPhone OS was released earlier this month as a developer preview. The iPhone OS 4.0 Facebook integration was first discovered, believe it or not, by the Gunning For Safety blog, a product marketing site developed for a class project by a team of Boston University students. Later, gadget blog Engadget said it also found in iPhone OS 4.0 the same .plist files referenced by Gunning for Safety. If the rumors are true, the decision to bring basic Facebook functionality into the iPhone shows the growing importance of social networking for the current generation of smartphones. Motorola's Motoblur--a UI overlay for the manufacturer's Android-based devices such as the Cliq--integrates your social networking accounts with your device's contacts manager, but also includes a constantly changing home screen that shows your friends' new status updates, uploaded photos and other social networking activity. Microsoft just launched a Motoblur-like device called Kin. And the company's upcoming Windows Phone 7 mobile operating system will also integrate social networking information into the contacts section of upcoming Windows 7 devices. Considering that many iPhone competitors are embracing social networking as a core part of the mobile device experience, it's no surprise that Apple would want to capitalize on this trend as well. 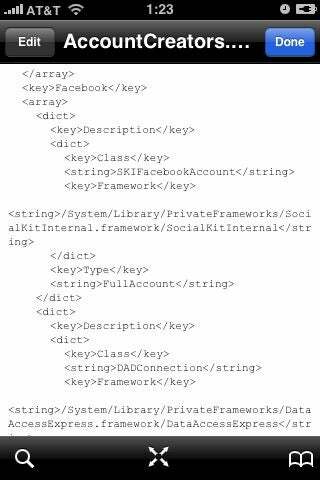 The rumored iPhone Facebook integration is based on a new iPhone framework called "SocialKitInternal.framework," which some have theorized could also be used to include deeper integration with other social networks such as Twitter and MySpace. Facebook already offers an iPhone application to sync your Facebook and iPhone contacts. 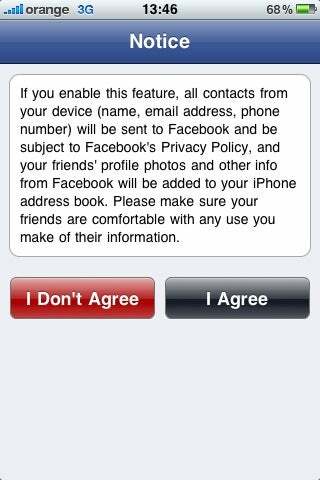 To do this open up the Facebook for iPhone app, tap on 'Friends' and select the 'Sync' button in the top right corner of the screen. If the rumors are true, the iPhone's native Facebook integration may also capitalize on Facebook's highly rumored Project Titan --a fully functional Facebook e-mail service with POP/IMAP support.